Brendan Murray is a man on the edge. 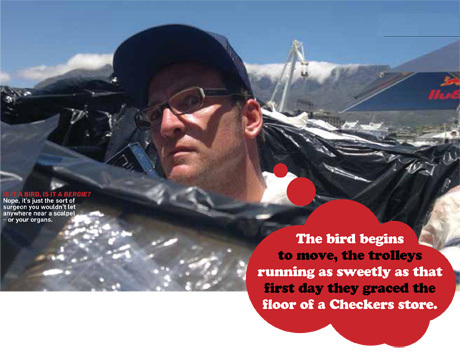 He and three friends, Devlin Filmalter, Shaun Fickling and Kieran Duggan,are grappling with a four-metre-tall ostrich, readying chipboard,cardboard, black bags and two abandoned Checkers trolleys for a plunge into the cold, dark waters of the harbour. They are to launch themselves from a ramp in front of 200 000 spectators and millions more the world over. Their fervent hope is that their creation – based somewhat ironically on a flightless bird – will glide. Ambitious? Yes. Crazy? Definitely. Looking at the bird and their makers,one has to wonder. The boys are tired. 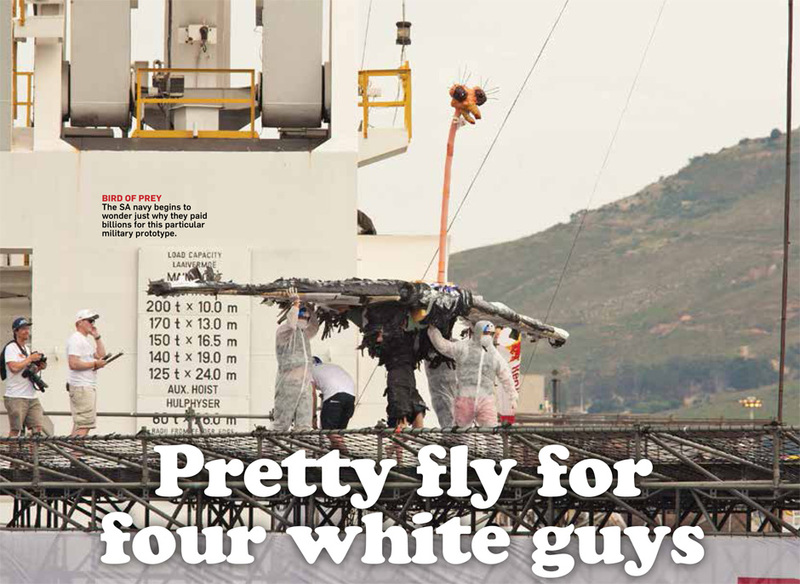 They’re at the tail end of a 48-hour straight build, working frantically through day and night and then literally carrying their craft (named Intshe – Zulu for ostrich) to the Waterfront from Sea Point, her wingspan too much for Brendan’s ’90s BMW. The four stopped at McDonald’s for a snack, but were denied, as the bird wouldn’t fit the drive-through. ‘We didn’t expect to get in,’ says Brendan, a hand on his teammate’s shoulder, ‘but we’re here now.’ He gestures at the line of 41 craft awaiting their chance at ‘glory’ – birds, planes, choppers, rugby balls, curry monsters and giant moths. The colours are dazzling, not least those of the guys prancing about in full red body paint, confident that they know what they’re doing. Word arrives that the judges are coming – two teams, one to evaluate the group’s creative flair and the other to pass judgement on whether or not the craft is safe enough to fly. The boys change gears, frantically working to ready the bird. Kieran sees Devlin jabbering to me and comes hurrying over, shooing him away. ‘He doesn’t know what he’s saying,’ says Kieran. ‘He’s not eaten in three days. As our pilot, he needs to keep his weight down. And he’s nervous.’ Kieran tenderly covers Intshe’s exposed wing. The team gathers together and costumes up. Soon, a full white suit of scrubs covers each body, a surgeon’s mask settles on each face. The tension begins to mount. Brendan stands slightly apart, rehearsing the team’s story. Brendan nods at the rendition. The judges arrive. All turn to meet them. It’s 7am the following day – race day – and lines of traffic snake out of the Waterfront. The clever ones are here already, camped on restaurant floors among tables still upturned. The boys are rehearsing their pre-flight skit. The combination of last night’s liquor, lack of sleep and the absorption of litres of sunscreen over the last three days has rendered these crafty creatures barely capable of organised thought, never mind glorious flight. The good news is that Intshe was cleared. The boys lift and turn their construction, the whole bird rising, but in different directions. Brendan stalks off and Devlin collapses in a heap. I slap on some sunscreen and make no comment. Privately, I wonder just where it was, in the last two days, that these boys broke with reality. At around 9am a slow-moving line begins to form as teams wheel their respective creations from the hangars. There is a Pegasus among them and a naked man with a rhino horn covering his groin. Sitting in the stands the sight is spectacular and existentially taxing. 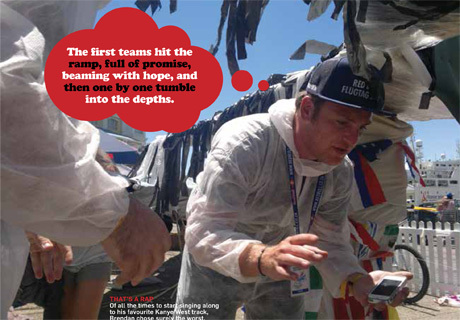 The first teams hit the ramp, full of promise, beaming with hope, and then one by one tumble into the depths. Emotions among the loved ones of Team Eggception are running high. ‘It’s too much,’ says Jen, Devlin’s ex. ‘I can’t,’ says Kieran’s brother, covering his face. ‘Somebody, somebody help them,’ pleads Shaun’s mother. The crowds are clinging to the wharfs and piers, chugging down icy drinks. They’re witnessing a spectacle – the grand show where teams of ingenuous engineers strut their stuff, but they haven’t seen the other. They don’t know that, right now, men and women are standing in the wings quietly and nervously with their craft, dreaming of Flugtag glory. They don’t know how much it means after all this work. Will Team Eggception crack? Will they simply fade like so many of the rest? Will their gamble, their near complete lack of a technical plan, turn out to be some kind of miraculous strength? Time flows, the sun passes overhead. More and more tumble into the inky green. The harbour groans beneath the weight of so much humble, human splendour. Breaking point is upon us when, at 2:50pm, the figures of three internationally renowned surgeons and their birdman come striding out onto the ramp, Intshe a surreal and mythical creature already seeming to float between them. Brendan is afire. Grabbing the microphone he launches into a powerful oration of the history of the doomed bird and single-handedly blows all other attempts at pageantry apart. These guys have story, they have theatrical know-how, they know what they’re about. ‘Fly, ostrich, fly!’ we all scream as the wind takes her, tugging at her wings as she surges upward, defying the laws of physics for just a split second, reaching out towards the dream … and then drops like a sack of hammers. The surgeons and the birdman splash into the harbour just like the rest. Intshe’s dream is over, but the memories remain. Afterward, when all the teams have tasted the water and the planes have flown and fallen, at a time close to evening when Goldfish are spreading their gentle electro beats through the shopping centre on the sea, I catch up with the team. ‘It’s an incredible feeling to take on gravity and have everyone buy into your madness,’ says Kieran, playing with the soggy label of a half-drunk beer, four inside him already.